Get out your lighters and cell phones. It's time to genuinely fake out all of your friends and tell them you're enjoying U2 this St. Patrick's Day. 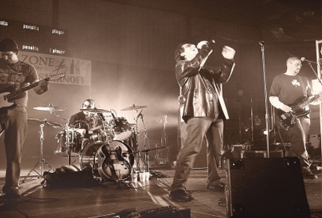 It may not be the real Bono in the flesh, but U2 Nation, one of the country's best U2 tribute acts, is coming to Atlantic City for two live performances in honor of the Irish holiday. Brad Grauer, bassist and Adam Clayton clone for U2 Nation, says people faking out their friends at their gigs is a common occurrence, and he can't deny that he loves that. "When people hear some of our live recordings, they ask, 'Is that really you?' and I'm proud of that," Grauer says. "People hold up their phone and take pictures and probably shout to their friends, 'Guess what!? I'm at a U2 concert right now' It's a thrill." But all faking aside, Grauer explains that he and his bandmates are all extremely serious about their craft as a U2 tribute act. "We try not to be a cover band; we really dissect the song to understand every note and tone and effect to create the same exact sounds," he says. "We consider 'good enough' as not acceptable. We are giving people what an exact U2 performance would be. We each have exact costumes that match what you'd see on the latest tour, especially like the glasses that Bono would wear." And it's not just the look. U2 Nation plays all U2 songs from 1982 to the latest U2 album, which was just released on March 3. "We try to play a lot of the hits that people know - the rapid-fire, friendly songs - but we like the deeper cuts, as well," Grauer explains. "When people ask for rare ones, we can pull it out of nowhere and give that to the audience. We like to duplicate live songs like 'Party Girl,' which was from 'Under A Blood Red Sky,' and we try to slip the rare ones past all the big hits." When asked the obvious question, "Why U2?" Grauer gives the honest answer that U2 Nation does this almost entirely for the love of U2's music. "We support what they do as a band, you know all the humanitarian efforts, but we really wanted an avenue to connect to a diverse group of people. U2 reaches people of all ages, and we can play music that they genuinely like to a wide audience." If you missed out on U2 Nation last year when they performed at the Atlantic City St. Patrick's Day Parade, you should certainly come and see them this year. U2 Nation rocks Ri-Ra on Saturday, March 14, at 10 p.m., and The Trinity Irish Pub & Carvery inside The Pier Shops at Caesars on Tuesday, March 17, at 7 p.m. "We love to travel to different states and different areas and deliver this music; we love getting down to Atlantic City - especially for St. Patty's Day," Grauer says. What They Play: All U2, all the time. Seeing U2 Nation live is the next best thing to catching the real band in the act. Roster: Brad Grauer plays Adam Clayton, bassist; Jeff Pizi plays Larry Mullen, Jr., drummer; Vincent DeMasi plays The Edge, guitarist; Al Saadi plays Bono, vocals. Fan Favorites: "When The Streets Have No Name" and "Pride In The Name Of Love." "People request those the most, and always want to dance," Grauer reveals. If They Ever Meet U2: "Oh, it would be amazing to meet them," Grauer says. "I don't know what I'd say. I mean, we are playing the same music. I'd ask them to close their eyes and listen. I'd probably thank them for making such wonderful music, and that I'm so appreciative to have so much fun playing their music." Claim To Fame: DeMasi is a regular contributor and freelance writer for Guitar Player magazine, having penned more than 200 articles, including "10 Things You Gotta Do To Play Like The Edge," which was in the November 2008 issue. Fun Fact: "We have a lot of vintage equipment, and our instruments match the models that U2 uses," Grauer says. "I actually own the exact amplifier that was on 'Monday Night Football' from September 25, 2006, when U2 reopened the Super Dome for the New Orleans Saints - I own that amplifier! We go to extremes to not just have a copy of the equipment, but to have any actual pieces we can that U2 use. And my amp has all the settings that the tech marked from that night, so I can get even closer to the exact tones and sounds that they play live with." Go See Them: 10 p.m. Saturday, March 14, at Ri-Ra inside The Quarter at the Tropicana Casino and Resort. Call Ri-Ra at 609-348-8600. Or catch them on St. Patty's Day as they rock the Trinity Irish Pub inside The Pier Shops at Caesars at 7 p.m. Call Trinity at 609-345-6900. Mr. Gahan is especially determined now to raise funds for Maureen's Haven because the shelter has hosted record numbers of homeless people in recent months. The charity is run by volunteers at 14 churches on the East End. Joining U2 Nation will be 26 + 6, a new local Irish rock band; the Mulvihill-Lynch Irish Dancers; and bagpiper Tim Kelly of Cutchogue, a longtime member of the Peconic Warpipes.An after-party down the street at Digger O'Dell's will round out the evening with food, drink, and music by local cover band Misspent Youth.Mr. Gahan said sales of the $20 tickets have been steady, and an "ample" number of tickets remains. Suffolk Times photo courtesy of U2 Nation Albert Saadi plays Bono, Riverhead resident Vince DeMasi plays guitarist The Edge, Brad Grauer plays bassist Adam Clayton and Jeff Pizzi plays drummer Larry Mullen Jr. in the tribute band U2 Nation, seen here performing in 2006. Suffolk Times photo courtesy of Caitlin Durney The new Irish rock band 26 + 6 features the eclectic violin of Shoreham-Wading River High School graduate Caitlin Durney. Suffolk Times photo courtesy of Debbie Lynch-Webber Members of the Mulvihill-Lynch Irish Dancers. U2 Nation, the evening's headliners, pays tribute to the 22-time Grammy award-winning Irish rockers. Albert Saadi plays Bono, Riverhead resident Vince DeMasi plays The Edge, Brad Grauer plays bassist Adam Clayton and Jeff Pizzi plays drummer Larry Mullen Jr. The tribute band formed in 2003 and plays regularly at casinos, Irish festivals and pubs in New Jersey, New York and Pennsylvania. U2 Nation tries to capture the sound and motion of the real band as precisely as possible, said Mr. Saadi. Though band members reside in different places all over the East Coast, Mr. Saadi said they still find time to rehearse, especially when U2 comes out with a new album, as it will next month. But U2 classics such as "Beautiful Day" and "Sunday Bloody Sunday" are like second nature to them. Mr. Saadi, 38, said the spirit of Bono inhabits him during each performance. The resident of Allendale, N.J., sang in an original band called The Mist. He worked with managers for Debbie Gibson, Foreigner and Run DMC but could never quite land a record deal. "It's a very, very tough thing to achieve," he said, adding that record executives would tell him they liked his stuff, but he sounded too much like Bono. So Mr. Saadi decided that he might as well just "do" U2 as a tribute band. Vince DeMasi, 39, of Riverhead, found U2 Nation on Craig's List and responded to an ad seeking a guitarist who could emulate the moody guitar tones of the The Edge. Also an accomplished solo guitarist, Mr. DeMasi teaches guitar in New York City and is a steady freelancer for Guitar Player magazine, getting to interview such guitar heroes as, most recently, Fleetwood Mac's Lindsey Buckingham. Debbie Lynch-Webber, director of Ronkonkoma's Mulvihill-Lynch Irish Dancers, compares the flavor of her troupe's shows to "Riverdance," the long-running Irish dance production. The troupe consists of seven to 10 dancers from all over the East End, ranging in age from 3 to 21. For the Vail-Leavitt performance, the troupe will dance for about 30 minutes, Ms. Lynch-Webber said. The costumes are colorful and elaborate, and the dance is exclusively Irish, from the graceful slip jig to the popular Irish jig. "We try to mix it up," she said. 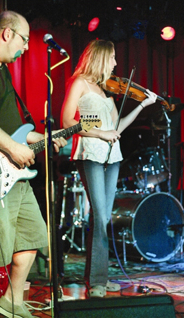 Violinist Caitlin Durney will lead her new Irish rock band, 26 + 6, in an acoustic set for the benefit. Ms. Durney, a 1999 graduate of Shoreham-Wading River High School, began playing fiddle in third grade. Trained in classical music, Ms. Durney soon applied her skills to many genres, including bluegrass, rock, folk, blues, jazz and Celtic. She used to play regularly for "Irish Nights" at Digger's in Riverhead and has toured with a Celtic band, playing throughout New York and New England. Tim Kelly, who will play solo bagpipes for the event, has been a member of the Peconic War Pipes for 10 years. The group was founded in 1997 and plays traditional three-droned bagpipe music at parades and festivals all over Long Island and New York City. Mr. Kelly said he's never played at Vail-Leavitt before, and when Mr. Gahan asked him if he'd play, he didn't hesitate. "It's Maureen's Haven," he said. "How can you say no?" Doors open at 7 p.m., show starts at 7:30. After-party follows at Digger O'Dell's on Main Street, with food and drink. Tickets: $20 in advance, $25 at the door. Advance tickets: 298-4145, e-mail tgahan@optonline.net.